You don't need to have your book with you to renew it. Just stop by the Library desk and let us know. Need to Charge Your Cell Phone at Lunch? Check out our new cell phone charging station! THANK YOU PTSA! 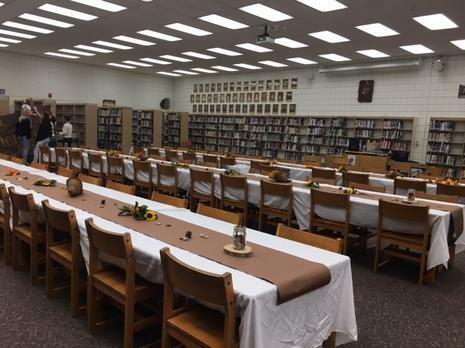 Monday - Thursday 7:30 a.m. - 4:15 p.m.
Friday 8:30 a.m. - 4:15 p.m.
Library all ready for our Thanksgiving Feast! WANT TO KNOW IF YOU HAVE OVERDUE BOOKS OR UNPAID FINES? Check your student library patron record regularly. See what books are on loan and what books are overdue. See if you have any fines. Click the My Info tab to see your account information. If you have further questions, contact Mrs. Quick or Mrs. Williams in the Library. What books and movies would you like to see in the library? Come in and fill out a request form and we will make sure it gets included in the next order. desk for you to look through. Years available are 1989 to 2018. Click the image above to see a detailed tutorial on how to use Google Drive. Click above to see the video tutorial on using Google Drive with our GALE Databases.